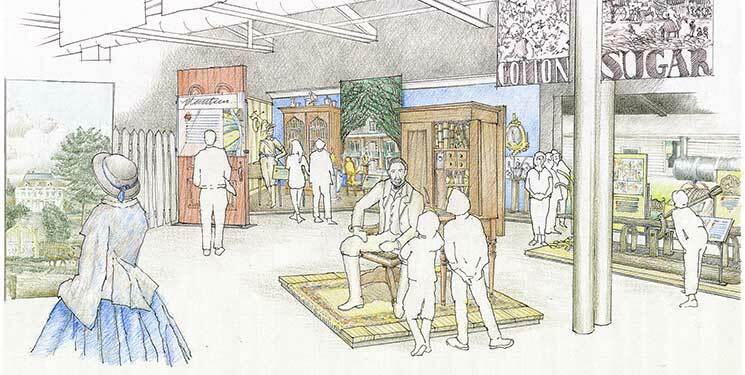 “Plantation Life” is one of the six proposed exhibits for the LSU Rural Life Museum Visitor Center. Tucked away off of Essen Lane lies the LSU Rural Life Museum, a tribute to a simpler time resting in the middle of a bustling Baton Rouge. The museum comprises 32 buildings spread across 25 acres that were donated by the Burden family. “It’s really a gem for Baton Rouge,” Juliet Youngblood, a Burden family member, said of the museum. “Others come and enjoy the blessings my brother, Lester McNeil, and I enjoyed as children,” Youngblood said, describing the open-air museum as an opportunity for the public to enjoy peace and tranquility. The museum, which opened in 1970, contains artifacts that exemplify everyday rural life through the 19th century. It holds the largest collection of Louisiana vernacular architecture and the most extensive collection of material culture artifacts from the 18th and 19th centuries. Though much of the museum is outside, inside rests a great opportunity. Youngblood and her husband, Thomas, are major contributors to Whispers of Change, launched in 2006 as a fundraising effort to build a visitor center. Now that the center is complete, the second phase is actively in progress. Whispers of Change: Commemoration, Preservation, Education aims to raise $1 million to populate the visitor center with movable artifacts and exhibits, and an additional $500,000 to begin an endowment fund that will sustain and preserve the property. There will be six exhibits in the visitor’s center: Plantation Life, The Yeoman Farmer, Slavery in Louisiana, The Civil War, Reconstruction and The Industrial Revolution. An introductory film area will provide a brief video to explain the exhibits. All exhibits will guide visitors to the outdoor museum and provide information explaining parts of Louisiana’s rural history. Donors have generously given more than $850,000 in gifts and pledges to Whispers of Change: Commemoration, Preservation, Education. Construction of the exhibits will begin summer 2013. Explus of Dulles, Va., is working with the museum to create dynamic, multimedia exhibits. Explus’ clients include the World War II Museum in New Orleans and the Louisiana State Museum in Baton Rouge. Youngblood said the public, educational museum presents history as truth and helps others experience what rural life was like.